A little while ago I was asked about how one would go about testing Eclipse Fedora Packager’s Bodhi functionality. Unfortunately it’s not too often that I, or someone else may push an update that coincides with testing. The last approach I considered, turned out to be the simplest. Create your own Bodhi instance! Instructions are here. 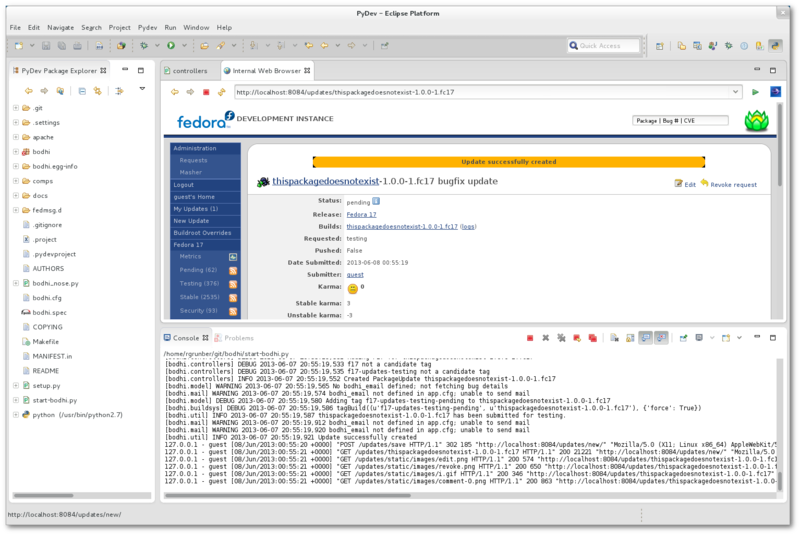 I had some issues compiling on Fedora 18 with fedmsg, so I disabled calls to fedmsg.publish, but for the kind of testing planned that’s not really too important. When determining if a package will be pushed, Bodhi consults the buildsystem to determine whether the action is valid. By default, the buildsystem is a mocked up version of Koji (buildsystem = ‘dev’) that will perform almost any action. You could also set the buildsystem to be Fedora Koji, or maybe even point it to your own Koji instance. This other patch also needed to be applied if you leave your Bodhi instance using the ‘dev’ configuration to properly handle the tags. # The following are not available as eggs so we can't uncomment them. -""" Start script for bodhi """
+""" Start script for bodhi """
Subject: [PATCH 2/2] Add rule for the usage of the 'dist' prefix. The dist prefix has not been used since f15. +            distStr = "" if int(release[1:]) > 15 else "dist-"
After applying those changes, I pretty much had a working local Bodhi instance that could push updates. Just about everything could be done within Fedora Eclipse, using the Eclipse Pydev plugin (yum install eclipse-pydev).